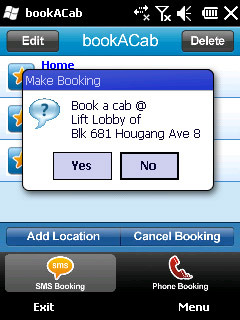 Make taxi bookings easily, with bookACab. 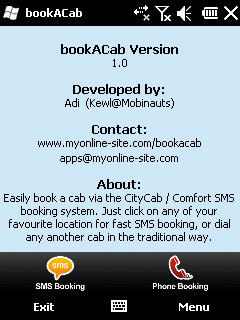 bookACab allows you to conveniently book a cab via the CityCab & Comfort SMS booking system. Simply enter your address and pickup point and bookACab will generate the proper SMS format and send it. 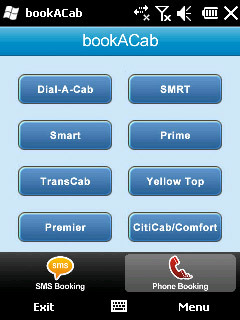 There is now no need to wait for the operator to pick up your calls. If you make regular booking from a particular location, you can even store that location into your favorite list, for quick booking in the future. 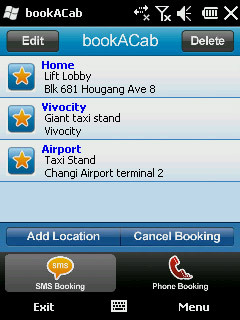 Alternatively, you can also make a booking via the traditional way of calling for the cabs. 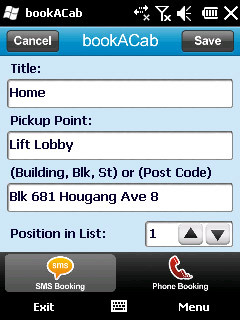 Quick dial any cab company without knowing their phone numbers, Just click on the icon of the taxi company you want to call, and bookACab will dial the number for you. very good app, strongly recommended.